Urban Horse promotes a Marjoman Leather Horse Straightness Training Reins With Trigger Clips for Aiding in Groundwork / Working in Hand / Training or Riding Your Horse or Pony. This beautifully made Leather Horse Rein is designed to work with the Marjoman Leather Training Cavesson or any Horse Cavesson or Lunge Cavesson to be long enough to work with your horse from the ground. The trigger clips easily clip between any rings / fixings to aid in changing the rein / direction easily. The supple leather is really nice to handle and is fabulous quality. The Leather Horse Training Reins have been specifically designed to be long enough to enable you to train your horse from the ground and also to be used when riding as well. There is NO BILLET / BUCKLE on the middle of the reins to stop the mane getting caught when working with your horse. 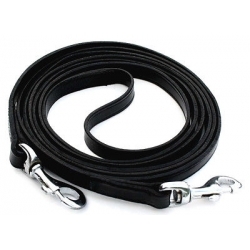 The Leather Horse Training Reins are Made from the Finest Quality Materials but Affordable!